Need some recommendations to paint your toenails for the holiday season? Searching for some cute Christmas toenail patterns so whenever you remove your ugg boots or your shoes, you are actually showing off your happy feet? You do not have to go to the salon to have ‘Tinsel Toes. ’ You can do this yourself and have fun trying! There are so many lovely holiday patterns for your toenails; you won’t know where to start. 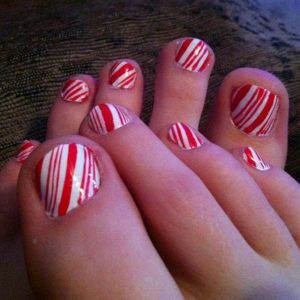 A really awesome toenail design that is quite simple is the Candy Cane nail design for your toenails. Just paint all of your toenails white. Let it dry then paint slanted red stripes along your toenails over the white, after that voila! You have your candy cane toes. Also, it’s so easy to do. You may also come up with a few other beautiful designs depending on your hand painting skills. However, many people aren’t extraordinary artists with regards to their toenails, so another easier design is the ‘Gift Box’ design. Paint your nails different colors- reds, blues, purples- all could be sparkly of course. Then, just paint a vertical line in the center and a horizontal line in the middle from side to create your toes seem like they are each little gift! 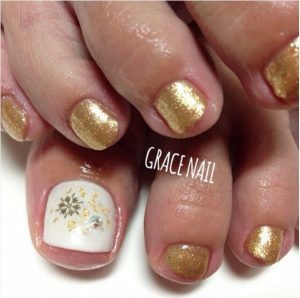 Have a great time making your toenails sparkle in the Christmas spirit this particular holiday season! 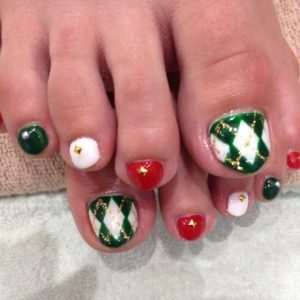 Here is a great Christmas nail design for your toenails!! !